It is customary to consider two aspects where materials are concerned: its volume, which gives it its physical properties (mechanical, electrical and thermal etc.) and its surface which gives it its physicochemical properties (optical, corrosion resistance, friction coefficient and wear resistance etc.). The research activities of the CorrIS group are focused on the latter and especially on surface reactivity and the physicochemical properties that ensue. This activity is oriented towards the characterisation of all types of surface, from that of solid, unfinished or unformatted materials (what is known as structure), modified surfaces subject to high energy treatments (laser, shot-blasting etc.) or thermochemical surfaces (nitriding, carburation, carbonitriding etc.). Significant advances in the surface treatments have lead us to touch on coatings, conversion layers and corrosion inhibitors which once absorbed into the surface of a material, form an organic barrier between the substrate and the surrounding medium. The team is recognised for its work in corrosion prevention and the battle against corrosion. Furthermore, a material’s response to load requires an increasingly multifunctional surface approach. 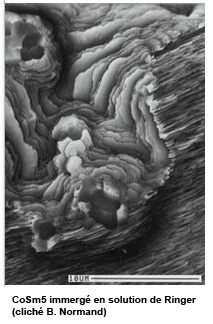 When corrosion is assisted mechanically, it leads researchers to study stress corrosion cracking, erosion and cavitation corrosion, tribocorrosion and the effects of hydrodynamic phenomena on surface electrochemical behaviour. When it is a question of studying the barrier properties of surfaces (passive, organic/inorganic hybrids, nano-hybrids, paint) where the dielectrics of the film are taken into account or the physi-chemisorption properties when corrosion inhibitors are touched upon. This multipurpose approach involves looking at all classes of material (metals, ceramics, polymers and composites) and a wide range of characterisation tools. With this in mind, the studies conducted by the CorrIS group are relative to mastering the performance of an industrial product regarding its resistance to an aggressive environment while taking into account the functionality that goes with it. These studies fall into the Materials Science category and are concerned with how long the assembly and systems will last, using a global approach to the choice of durable solutions and choice of materials available.